This stepladder has a strong personality and great functionality. It is also a successful marriage of form and function. 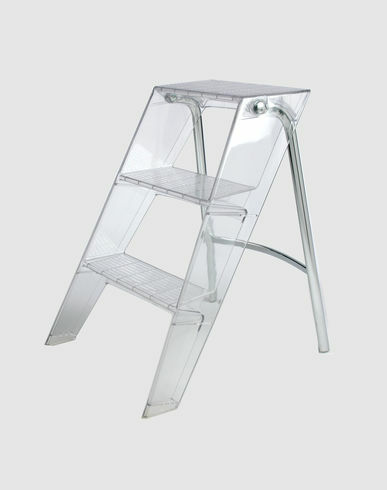 Upper is practical as a result of the special technology employed by Kartell: this technology allows the polycarbonate to be shaped to attain the durability, strength and toughness required for a stepladder. The metal structure is robust and welded to a polished and crystalline body in transparent polycarbonate. The slip-resistant steps are practical and safe. This item is not only highly functional and practical, it is also attractive and can even be used for decoration. Alberto Meda was born in 1945. He studied in Milan until 1969. Between 1973 and 1979, he was technical director at Kartell, where he was responsible for plastics technologies and furniture production. From 1979 he was self-employed as a designer in Milan. He was a technical design consultant for Gaggia and for Alfa Romeo. His training as a mechanical engineer has certainly stood Albert Meda in good stead; it has also induced him to give priority to construction at the outset of a project rather than the formal aspects of design. The boundless possibilities afforded by modern technology are viewed by Meda as a "supermarket of creative possibilities".